Musings of The Mom Jen: Happy Father's Day! Home > beach, Family, holidays, Hubby > Happy Father's Day! Spent the day, you guessed it at the Boardwalk! This was at Hubby's request. 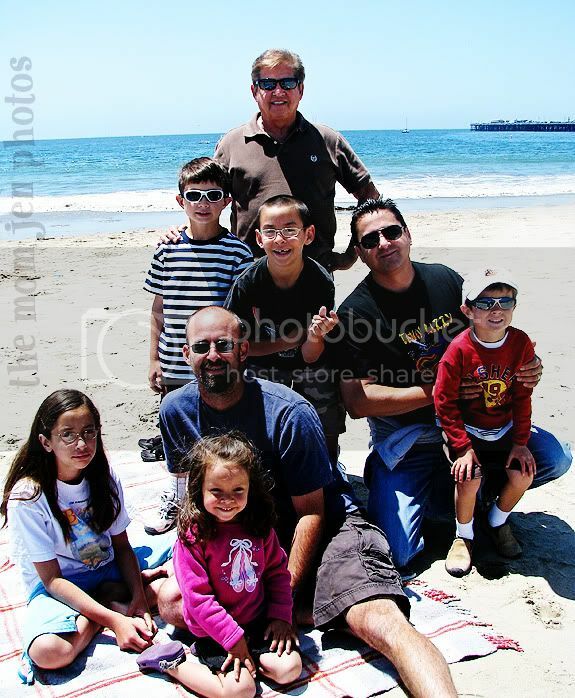 Yaya, Papa, Uncle M and Aunt B, Cousins T and B joined us. We had a nice picnic lunch on the beach, then made our rounds on the rides. Props to cousin B who took on the Log Ride like a champ! Aww that's such an awesome family picture! Such a great pix, but really you can call me Betsey as opposed to Aunt B (picture the Andy Griffith show). B fell asleep on the way home after talking over and over about the log ride. Shame me and his dad couldn't figure out he just needed us to ride with him. Can you say loser parents? Awwww! What a great family photo! Looks like everyone enjoyed their Father's Day! What a great way to spend the day and thanks for the adding the picture so we all can see the smiling faces of the happy Daddies!! Glad you guys had a great day!! Such a great family picture and a great way to spend the day. Funny, my MIL swears by Bonine..but I've never tried it.